“Johnny” from Massachusetts was your typical 10 year-old. The oldest of four, his mother “Susan” had carefully followed his program of study. She attended conferences, read magazines and blogs about upcoming curriculum ideas, and spent a small fortune on books and games that would give Johnny the skills he would need to lead a successful life as he got older. Early on, Susan recognized the importance of the computer to her son’s education. She realized that computing is a way of life today. The key to success when living in such a computer-centric world is to develop keyboarding skills. There was only one problem. Johnny didn’t know how to type. So, Susan went out and bought a popular learn-to type software program. It was filled with fun exercises, flashing lights, sound effects, and typing games, and Johnny was able to advance at his own pace, “completing” the course in less than a week. He still didn’t know how to type. Think of an athlete. Hitting a baseball, throwing a football, or kicking a soccer ball is effortless...a result of repeated practice. They perform basic skills naturally, without thinking. It’s the same with any skill, even typing. Along with educators, we’ve studied students in various learning environments for over two decades, watching and developing methods to improve the learning process. We concluded that young people with and without learning issues, can succeed more effectively through the use of computers. And when they learn to touch type, they are able to channel their focus on what they’re learning. Their fingers actually become an unwitting extension of their brains! It’s all about muscle memory. Great typists, like great athletes, need to learn the fundamentals by practicing them day after day, building new skills only after they master something less difficult. An effective keyboarding program should be systematically designed so a student must truly master a skill, before advancing to a more challenging one. To make this program more productive we have developed a unique product called Finger Guides. These Guides attach to most standard keyboards with Velcro pads and guide a student's fingers to the correct keys, allowing them to learn touch-typing without incorrect, error-prone moves. In a lot of ways, we’ve just gone back to basics, creating a structured but simple way for students to learn how to type...a skill they’ll use nearly every day for the rest of their lives. Carrie Shaw is the President of Keyboard Classroom, one of the fastest growing learn-to-type software programs in America. Her website is www.keyboardclassroom.com and she can be reached via email at carrie@keyboardclassroom.com. You can read our review of Keyboard Classroom HERE. They've since added new pricing options - "A Single User License plus FREE Finger Guides is $39.95 and can be reused by other students once the first student is done. You simply erase their data and start a new data file. 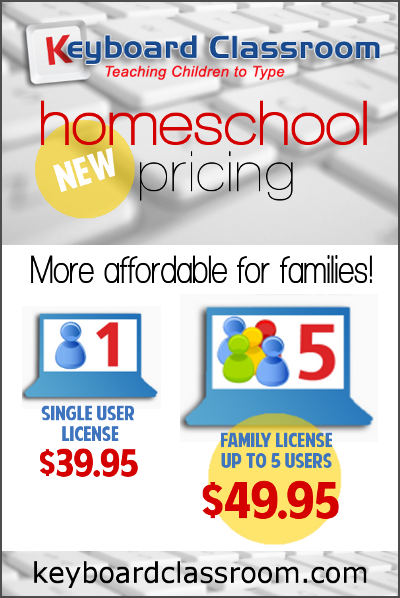 Our new Family License with FREE Finger Guides is just $49.95 that allows you to have up to FIVE users simultaneously."